The Cross Keys01377 288272work InnThe Cross Keys at Thixendale near Malton is a traditional small Yorkshire CAMRA award-winning village pub, situated at the convergence of several valleys which form part of Britain's most northerly chalk outcrop known as the Yorkshire Wolds. This is a particularly beautiful, relatively unknown part of Yorkshire with its green valleys and rolling countryside. Thixendale is in the heart of this region and has 3 major walks/paths running through it as well as several shorter more local walks. The major walks are The Wolds Way, The Chalklands Way and The Centenary Way. The Cross Keys helps to cater for both its regular clientele and visitors alike with its inclusion in the CAMRA national Good Beer Guide for the last decade or so and its menu of traditional pub food. 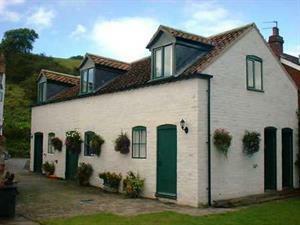 It also boasts 3 twin/double en suite bedrooms in a recently refurbished stable block annex. Packed lunch 7.00 Luggage Transfer 15.00 per trip up to a distance of 15miles Children welcome from age 14. The bedrooms are all on the first floor of a 200yr old converted stable and unsuitable for wheelchair users.A wheelchair can be brought into the pub but toilet access would need to be on foot.